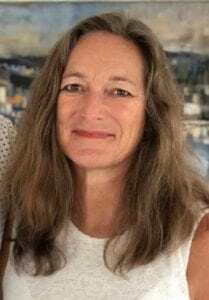 Every novel is special, but debuts especially so and I’m delighted to welcome Louise Mangos to the blog today! Louise’s debut novel, Strangers on a Bridge, was released in ebook by HQ Digital last month. I’m reading it at the moment, folks, and I have to say it is a gripping yarn! The paperback version will be published in August. In the meantime, here’s Louise to tell us a bit more about it. While out running one day in the Swiss Alps, English-born Alice Reed prevents a man jumping from a notorious suicide bridge, and he begins to stalk her. My favourite character is Oliver, Alice’s youngest son. When I began writing the novel several years ago, my children were younger than the boys in the novel, but I often find it uncanny that my youngest son has partially become the young boy I created, although there is no similarity to the things Oliver experiences in the novel. My own son is changing and maturing in the way I hope Oliver will beyond the end of the story. Two novels had a lasting influence on Strangers on a Bridge and I have long admired their authors for all of their work. The first was Enduring Love by Ian McEwan. The way he described the effects a stalker has on the protagonist’s life completely absorbed me, although the victim in McEwan’s novel is a man, and the setting could not be more different. The second was Louise Doughty’s Apple Tree Yard. Without revealing any spoilers for either Doughty’s or my novel, she shows how to create a devastating twist by keeping the reader out of an antagonist’s psyche, and this is what I wanted to convey in Strangers on a Bridge. My first novel took years to reach its final form. I wasn’t very disciplined when I started writing. I had a beginning and an end in my mind, but no real direction as to what would happen when I got there. Ultimately, I ended up writing beyond my initial ending. The novel has been dissected and put back together several times, and yes, there has been chaos on the cutting room floor. The second novel, another thriller to be published with HQDigital next spring, needs very little structural editing (according to my editor). It was far more planned out, and took much less time to write once I had the basic plot in my head. The third thriller has been even easier to write. I think authors learn so much in the process of writing their first novels. I’m currently working on a historical crime novel, and this is a completely different process. I have to do so much more research, and have had to further tighten my writing discipline, paying more attention to the voice, dialogue and avoiding anachronisms (it is set in medieval Switzerland). It’s an altogether different process, and the work will take longer than books two and three together. Adamant that they have an instant connection, Manfred’s charming exterior grows darker and his obsession with Alice grows stronger. Thanks, Louise, I can’t wait to see where Alice’s journey takes me! You can purchase Strangers on a Bridge here. Louise writes novels, short stories and flash fiction, which have won prizes, placed on shortlists, and have been read out on BBC radio. 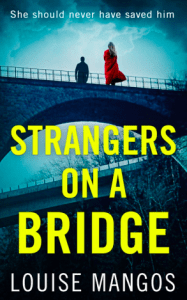 Her debut psychological thriller Strangers on a Bridge is published by HQDigital (Harper Collins) in all ebook formats and comes out in paperback on August 9th, 2018. You can connect with Louise on Facebook and Twitter @LouiseMangos, or visit her website www.louisemangos.com where there are links to more of her stories. Louise lives in Switzerland with her Kiwi husband and two sons.